The Duchess’s favourite off duty shoes are the Henrietta style by French Soles. My review on French Soles Ballerinas is available here. One can find the ballerina style footwear in the different brands of shoes. 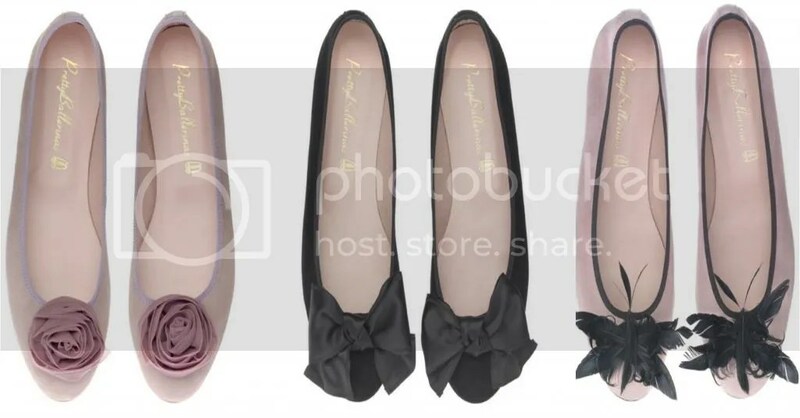 In London, besides French Soles, the other two well-known brands for ballerina flats are Repetto and Pretty Ballerinas. Pretty Ballerinas is the focus of this post. Pretty Ballerinas opened its first boutique at 34 Brook Street in Mayfair, London in February 2007. Their shoes have been sold online since 2005. Although the shoes have been recently sold as Pretty Ballerinas, they are manufactured in the same village on the Mediterranean island of Menorca by the same family since 1918. Pretty Ballerinas is known for its huge array of styles and colours and the unusual way materials are combined. Thoughts: Pretty Ballerinas do indeed have a wide range of styles. While the designs all have the classic round toed shape, they are available in a range of heels including wedges! The range of patterns and colours are unbelievable fantastic! I really like that you can find simple classic patterns such as the Brown Croc Printed Leather, fairly similar to the French Sole’s that the Duchess has been spotted wearing, to really funky cool designs using various colour combinations or materials. The above pictures are designs from their past season. Notice how the shoes designs are all round toed but they come with different embellishments?? I am totally in love with the feather ones! I love how Pretty Ballerinas have classic styles and colours that are fit for work, crazy embellishments and wild colour combinations for days when you need something to brighten your day and exquisite delicate embellishments perfect for formal night events! I urge you to have a look at the website to check out their latest designs. The Rosario Charleston is drop dead gorgeous! Sizing depends very much on the style. I am wearing a size 41 in Rosario (a round toed design) as compared to a size 42 (Square toed design in French Soles) and its slightly loose that I have to wear them with full length insoles. The weirdest thing is if I go down one size (size 40), it’s too small for my darn feet. I bought a size 41 in Barbara (which is round toed with a wedge) and it fits on my mom’ size 39 feet. The discrepancies in sizes really makes it difficult to purchase the shoes online! Pricing also varies a lot depending on the style and materials used. I have several pairs of Pretty Ballerinas and some are made of very soft leather while others are of sturdier leather.